The Kosciuszko Rally is on 13/14 October at the Geehi Huts in the Snowy Mountains. I might be up for that mate. I'll put it in the diary. Geez Gaz you need some dry weather up there to get you away from the Google. Sharon and I might just be down that way around then, me on the bike her in a tin top. I'll see if it can be co incideded. You're right guys ........ what else do you do on a cool rainy day but think about travelling somewhere on the bike. I don't even mind travelling on the bike when its a bit cool and rainy but at the moment I've 0 from3 rides available. The two K bikes are out for fork seals (K75) and tyres (K1100). The R80G/S has just had a new alternator rotor fitted (no surprise on an older airhead) and I have fitted heated grips and driving lights while I had it on the lift. Just a bit more wiring modification for the lights and it will be back in service. I'll be home still then so I might make it to that one. Last Snowy rally I attended was in '08. I was on my modded '77 R100. TWB looking at that photo of the R100 there is obviously a project story to be told that I for one would love to hear. Sure, it's not a K bike but most of us are interested in anything (well most things) on two wheels. Let's hope a few of us can make that Snowy run. Will this be one of "Gaz's" - "LONG CUTS"
When does Gaz do anything else? But it’s always a good ride in good kompany. 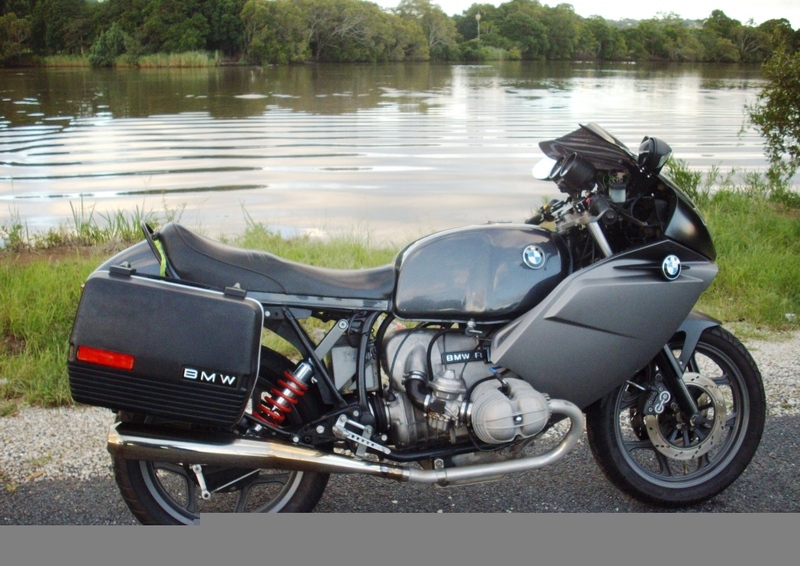 @Gaz wrote: TWB looking at that photo of the R100 there is obviously a project story to be told that I for one would love to hear. What started life as a 1977 R75/7, bought at the end of my high school years, is a far cry from its origins. I still own it. It morphed into an R90 with an RS fairing, then it was dual plugged. My dad rode it across America one year while I was away at uni. He passed in 2003 so I decided to restore it, which I did, but not really a resto, as it became an R100 with Nikasil cylinders & 9.5:1 pistons, '85-on shimmed rocker arms, R90S dual plugged and CC'd heads (compression bumped to 10.3:1), '340' M-E asymmetric camshaft, 40mm carbies and the exhaust ports were tapped to accept the 40mm no crossover pipe headers as well. I fit Raask rearsets, a hand-made exhaust from Epco in Ohio, a Motorrad Elektrik 450W charging system, Omega ignition, painted the panels and tank, and powder coated the frame. The mods you see here include a later Monoshock frame, K75S forks with Y spoke wheels, Suzuki brake discs, handlebar mounted master cylinder, and 4-piston Brembos, Motoren-Israel spin-on external oil filter, and the pièce de résistance, a K1200S fairing and clip-ons. The bike has nearly 800,000 kms (sorry, that's 500,000 miles) total with a third of that on the (second) odo. The engine (rods & mains), gearbox and final drive(s) have all been rebuilt. The bike sits in storage now for the past seven years in Beenleigh Queensland. One day I will dust it off. What a unique piece of gear and the long ownership makes it really special. Love it! Thanks for telling. Hope I'm around one day when you have it out again. Bought airline tix the other day for home. Arrive on 17 September at BNE, going north in Queensland for a week or two, then in Victoria around the last weekend of September. Plenty of time for riding. Depart for the US on 1 Nov from BNE. We'll keep an eye on your Aussie travels Daz and will certainly try to cross your path while you are in the great south land. Hi all fellow travellers this week! Well in between shifting house I've finally sat down to think about how some of us are going to get ourselves to Geehi Flats for the Kozzie Rally this weekend. Tom, Stuart and I are planning to leave the Branxton Rest Area at 7:30am on Friday morning and head south via a western loop to overnight at the Carrington Hotel in Harden then onward to the rally site via places like Adelong, Batlow, Tumbarumba and Khancoban. TWB - where are you this week? The link below is our planned track in the event that anyone wants to join us along the way. Currently swatting blowies away in dusty Boggabilla, NSW. Just paid $1.859 per litre for V-Power 98 and $4.10 for 1.5 litres of cold water. Dunno what the better deal was yet. Somewhere near Texas...Queensland, that is, and I'm whistling Rhinestone Cowboy. Taking my time heading south, plenty of stops along the way. Will likely turn up at Geehi Hut Thursday arvo and camp along the river out by the bridge. Catch up with ya's down there. Have a beaut ride. I'm riding to Leeton on Friday to go to the airshow in Temora on the weekend. Will head down near Werris Ck then across to Wellington via Premer and Coolah etc....then on down via as little of the Newell as possible to West Wyalong and through Ardlethan. Not sure if we'll cross paths anywhere along the way but I'll keep an eye out for you all. I just rode from Parkes through Forbes and on to Young in a combination of intense rain, slippery hail, bright sun and sideways wind. The last hour I had to constantly countersteer so my left shoulder's gone numb. The bike didn't miss a beat except for chewing through half a tank in 150 kilometres. I usually go over 200kms, easy. But, what a ride! I love adverse conditions whilst riding. Not a drop of water got in and when it stopped the sun came out to dry the outside of me. Sounds like a cyclone outside of my cheap motel room. Glad you're using up the weather extremes TWB so that we have a smooth run on Friday. 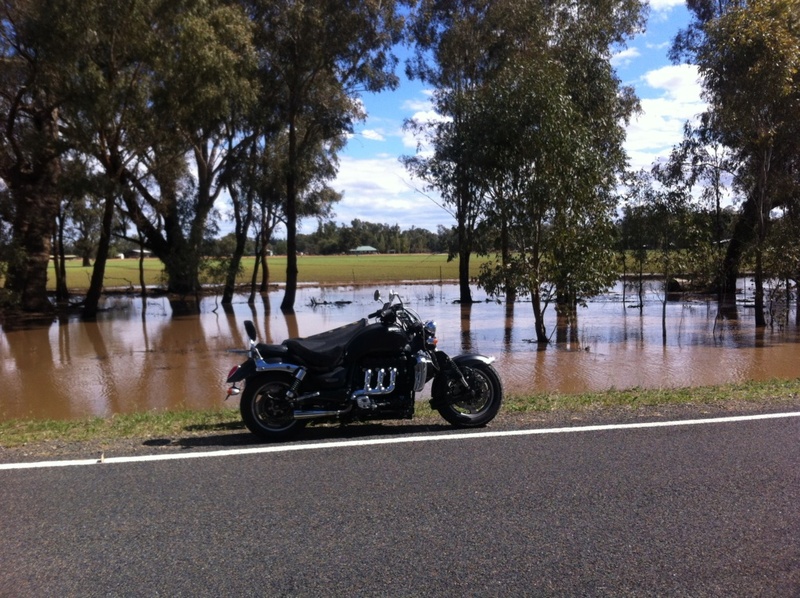 Sean, we tried to get accommodation at Cootamundra for Friday night but lucked out due to the airshow at Temora. Just shows how widespread are the benefits of big events staged out in our regional centres. You'll enjoy it - Waz and I took it in last year. We'll text you on Friday along the way to see if we are likely to cross paths. Have had the mapping cap on last night and have come up with this proposed route for our homeward run over Sunday and Monday. Overnighting on Sunday at the Black Stump Hotel in Trunkey Creek (where? ..you say). Anyone on those roads around that time keep an eye out for us. I'll be on my green naked K1100, Tom on his bronze F650 twin and not sure of Stuart's choice of mount. Round trip will be just under 900kms each way. Gaz & Co homeward route. The intense side winds have continued south of Young this AM, as well as cloudcover, which had abated a bit further north, heading out as I did from Young under bright skies. In Yass this morning it was under 15 degrees and going no higher with the aforementioned cold and damp feeling to the air, cutting right to the bone. I thought of riding through Canberra but even the hot air of the collective pollies wouldn't have warmed it up much. So, off to Tumut and points west tonight. Prolly turn up to the Kozzie on Saturday with a long-time riding mate, who, coincidentally, I met ten years ago at that very rally. I understand the forecast is to improve from Friday and over the weekend, however. I stopped in Gundagai just to whistle Slim Dusty. Atop Mt Parnassus a mad magpie decided my bald scone made a fair target. 'Twas only later, after pelting her with a coupla small stones to keep her in the gums, did I realise she'd only been guarding her helpless newborn stuck in the middle of the bitumen. I didn't handle the babe for fear of mother's abandonment. I managed to hold up my mobile to keep her at bay, and in the process, got her attack on film. When I can I'll put it to Goob Chewb so youse all can have a good squiz. The weather has improved markedly. Yesterday warmed up but remained quite blowy. After a clear, cool night of light dew under the billion star hotel in Tumut, it has calmed and warmed considerably. 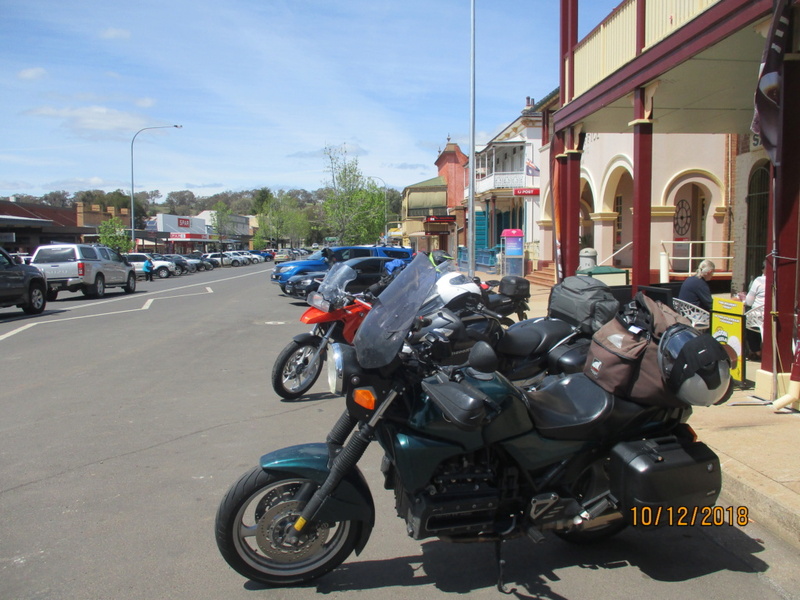 In Tallangatta now for pie and petrol, heading to Barnawartha then riding to Geehi tomorrow. Must say, that road from Tumut thru to Tumbarumba, then down past Mt Granya, is one of the best in Straylya! If the well-intentioned gubmint is worried it must be good...and it was. The FKR bunch (Tom F650, Gaz K1100, Stuart R1200RT) have bedded down in the pub in Harden after a good run down today. No rain at all, stayed cool though all day and fairly blustery. 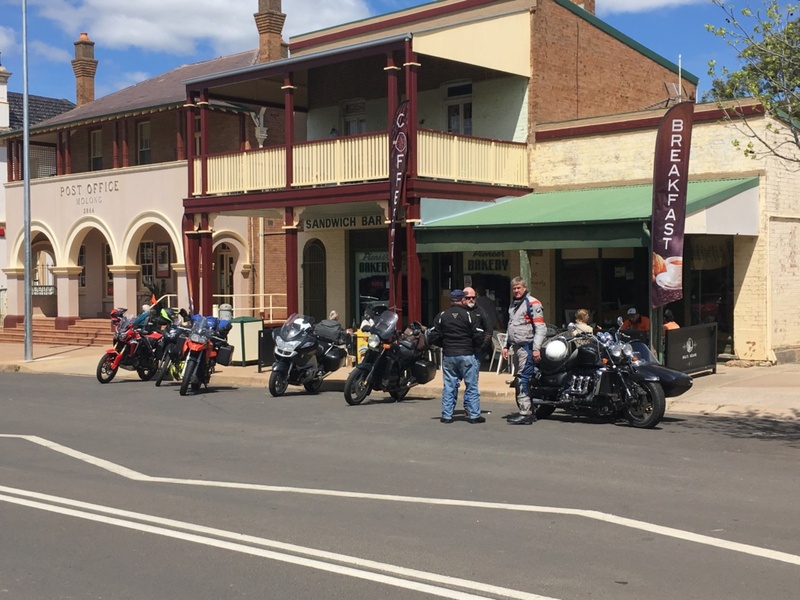 Had lunch at the pub in Molong and were just about ready to leave when a familiar bike rolled down the street. Guess who! Seanii was hard to recognise without the dogs in the sidecar. Nice to cross paths and have a quick chat before heading off on our separate ways. We’ll be into Geehi early afternoon Saturday and looking for that red RS. I had coffee in Harden on Thursday. Currently sitting at Shane O's coffee shop in Khancoban, looking at the mountains, some of which are covered in snow. Will be attending the rally site within an hour and a half. The weather is Springtime Victorian beautiful! Team FKR approach at the rally site of Geehi Hut with the goods! L - R: Stu, Tom & Gaz. About 100(?) people attended the rally in what is a quiet, tranquil grassy site next to a rapidly running river surrounded by tall gums and pines, mobs of roos, a friendly wombat, and a view of the snow-covered Snowies above. I'll let Gaz 'splain the FKR bit unless he already has. Cheers, gents, it was a great event. Was good to briefly catch up in Molong. 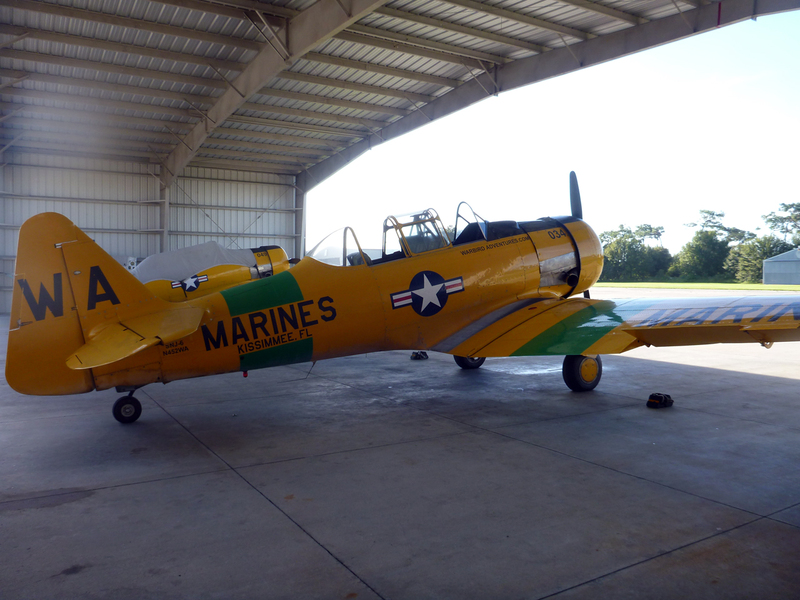 I thoroughly enjoyed the airshow at Temora and got in some quality riding miles as well as time with my brother. Hardly saw a drop of rain all weekend and during the 1800or so km travelled, though depending on which cloud you happened to be under, some decent falls were had, especially around Eugowra and Forbes. Some of the cattle went from the long paddock to the long swimming pool. That airshow turned out to be a bucket list thing and many pointless photos of barely discernible specks against clouds were taken. .... 2 flying Spitfires... 2 Mustangs, a Hurricane... even a Lockheed Hudson. Ok, so now I'm betraying my model making and Biggles reading boyhood. The Wirraway and CAC Boomerang were brilliant! Well, home again from the 2018 Kosciuszko Rally after an 1,800km round trip with good friends. I arrived back at base about 2:30pm Monday afternoon having waved goodbye to Tom and Stuart at Milbrodale at the top end of the Putty Road. Like Sean, we managed to dodge any bad weather save a short period in low cloud/misty conditions as we negotiated the section between Lithgow and Kurrajong crossing the Blue Mountains. It was good to catch up with Saxon 7 at lunch time in Molong. We had pulled up in front of the bakery but quickly decided a counter lunch in the pub opposite might be a better deal. Stuart enjoyed his lunch and seems to be the last one strolling back across to the bikes. The pub stop overnight in Harden was good fun - typical boisterous Friday night in a country pub. 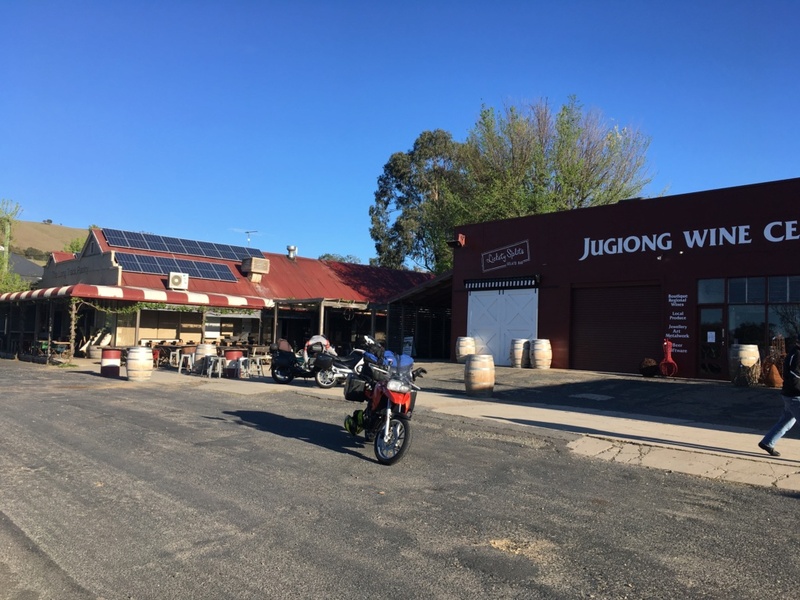 Saturday morning we were off at a decent time for a lovely little run down through rolling green hills to Jugiong where we breakfasted in style at the Long Track Pantry (left of picture - not the wine bar). The inevitable freeway section down the Hume Highway to Tumbalong was surprisingly free of traffic and we turned off to cruise through the lovely towns of the northern slopes of the Great Dividing Range like Adelong and Batlow to our lunch stop at Tumbarumba. After lunch it was the run to Khancoban through more beautiful green rolling hills with the odd glimpse of the snow covered mountain tops of the Snowies. Since Khancoban had the last pub before the Geehi campsite it was necessary to consume a cleansing ale and check that we had enough lubrication on board to get us through the night. Stuart opted to grab some cold ones and red grape juice while Tom and I each had the standard rally fare of a bottle of port already safely stashed in the panniers. We took in the mountain panorama from Scammell's Lookout in the national park on the way in. We found the Red RS and it's well travelled owner, TWB along with his Victorian riding buddy and arranged to saunter down to the area they had pitched tents as soon as we had set up camp. So armed with drinks and chairs we descended upon them hoping not to cause too much alarm (see TWB's picture of the arrival of the FKR bunch). As night fell the temperature started to drop quickly so a decision was made that all five of us would move to the nearest big campfire. Since we arrived at the fire with armfuls of firewood we were immediately welcomed and introduced all around. Lots of bike and travel banter ensued and it quite late before the inevitable sign that it was time for bed (the bottles were empty). Sunday morning dawned after a pretty cold night (around 0 degC judging by the frost on the open ground) with very heavy dew, so wet pack up of tents, consume the bacon & egg rolls, say goodbyes and we were off up the southern side of the mountains along snow lined roads to Australia's highest town, Cabramurra for coffee. 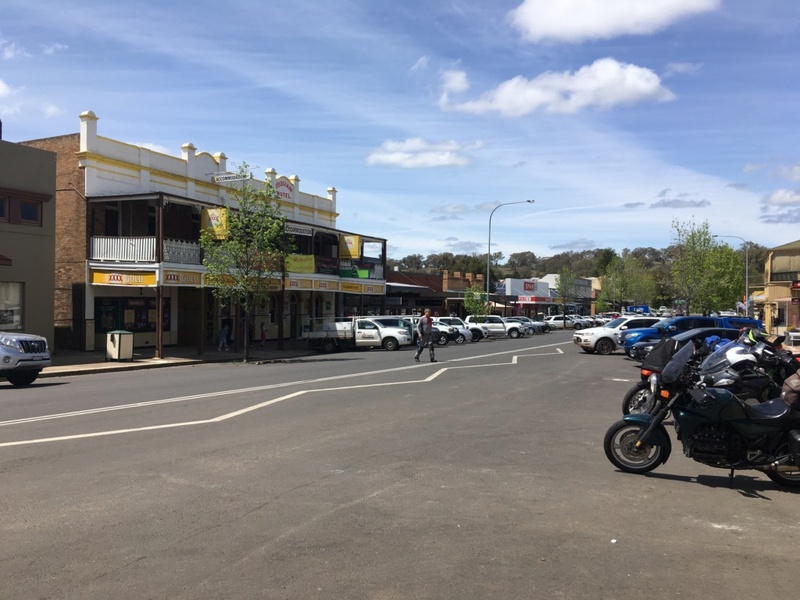 Our route then took us through the locality of Kiandra and north across the mountains above the tree line until we descended past Talbingo and into Tumut for lunch. The afternoon stretch north east along the Hume freeway was the opposite of our ride south - more traffic and heavy crosswinds made it hard going until we pulled off at Gunning for the last leg of the day up to the Black Stump Hotel at Trunkey Creek. This last leg was a delight - continuously up and down hills and bends of varying speed guidance signs. I think Stuart especially enjoyed it as it seems he has a problem with breaking off the small tangs on the outer edge of his footpegs. The pub was basic (well it is beyond the black stump) but hospitable and we enjoyed ourselves. Homeward bound on Monday morning up to Bathurst, Lithgow and over the Blue Mountains via the Bell Line of Road then north up the famous Putty Road for lunch at the well known Grey Gum cafe. Most envious of your pic there Gaz , especially with the snow caps on Mt Kosciuszko. Just to upset Saxon7 ... my logbook has 60 minutes dual instruction in a Wirraway. Can't find the logbook ATM but I still have the pictures. And yes, I'm jealous of all that riding. Lovely pics guys! It was a few years ago now though. That's OK the rally is finished for another year and I didn't get there and that's not OK.
Can I ask one thing Dai that you reduce the size of your pics because I am on a limited and fairly slow download which makes it about 1.20min to download the pic to display and I have to let it download first time or it tries each time if last time was not successful. Main thing is the waste of download particles. Most here wouldn't have the problem because they live in cities or at least not in the boonies like me. No problem Rick. I usually size them at 1280 x whatever, but if I reduce them to 1024 x whatever it will nearly halve the Mb size. At 1280 I would not think it should be a problem, do you use the servimg service because it's your pics that always cause a big wait for me. And here I am taking the lesson in life literally that I need to look at the big picture. It's a private server farm Rick, run by a small Austrian company that I sometimes give help to. They gave me a quiet corner to myself as thanks. It beats relying on any commercial outfit like Imageserv because I have complete control over what is on there but yes, the download speeds can be a bit slow when the data side is heavily loaded (which is most of the day, unfortunately). And it has far better protections on it than any of the commercial webhosts. That explains it. I was thinking that you may have been putting up the whole huge photo that a 20MP camera makes for one picture. When I see a pic you have put up I will just let it load and that way it stays in my cache. Since the Kozzie I've been trying to cover some Victorian ground, having not spent much riding time exploring the state where I was born lo these many years ago. 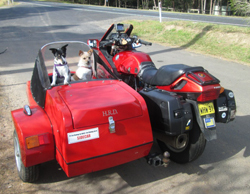 All I ever do is ride to Clunes to visit the rellies then back up to Queensland every year or so. Me and 'Victorian riding mate' Maugan, she who came to visit Pamela and I 13 months ago and borrowed one of my K1200R (yes, it is true, I do loan out bikes and have people stay at my house from overseas like the offer suggests) to ride round the state of Washington. 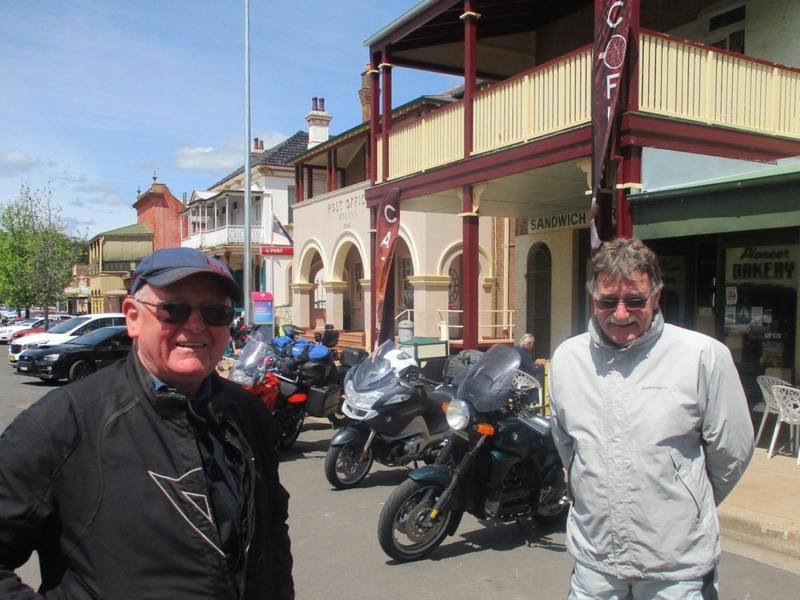 Anyway, we rode over the fine roads from Geehi to Khancoban, Corryong to Tallangatta, then to Barnawartha where it promptly rained for three days. I pushed the bike out of the shed and let the skies wash it and did day jaunts to Beechworth, Yackandandah, Myrtleford, etc. Once the sun came out again I rode the Mitta Mitta to Omeo road, fully sealed, in case you haven't been thatta way in yonks. What an amazing road; no traffic, 133+ kilometres of bends, up and over a mountain pass, through a temperate rainforest, then down along various creeks and rivers past the Blue Duck Inn (unfortunately closed last night). I camped in Omeo along the creek where it dropped to low single digits (in the more universal form of measurement) and soaked my kit through with dew of a morning. But, oh, the billion star hotel! 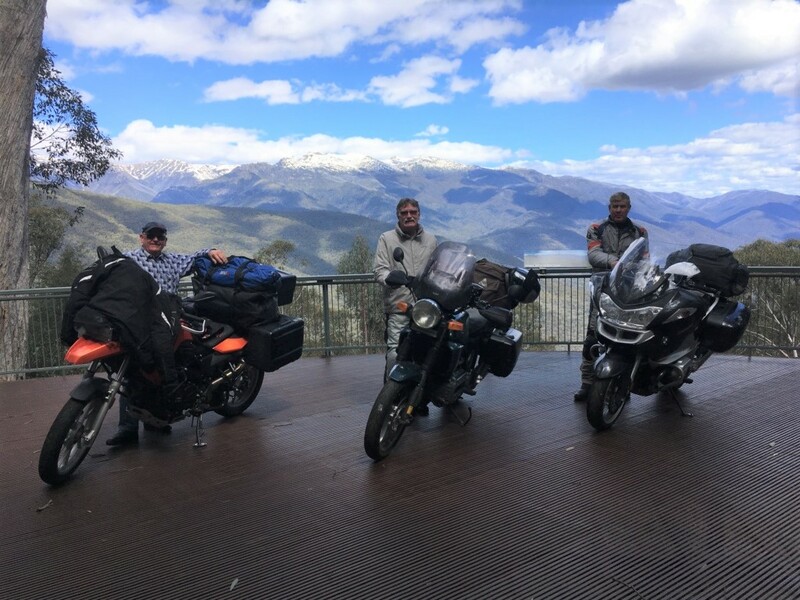 Today I backtracked over Mt Hotham to Mt Beauty, then the C534 road to Porepunkah, then up Mt Buffalo and down to the caravan park for the night. Twas an easy 300 kms of moto bliss under sunny skies and temps of easy mid-20s. Tamorree's s'posed to rain again, dammit. I wuz gunna see what the Spaghetti rally in Edi Upper near Wangaratta wuz all about over the weekend. Top of Mt Buffalo at about 1400 metres. Alpine riding near the incongruous 'resort' of Dinner Plain. A bit of scattered and passing rain, as expected, this morning. The kookas had me up at 4AM with their hilarious laughter. Time to squeeze out and roll up the sodden tent, don the raingear, and see what's next. Great to see you enjoying that beautiful country down there TWB. This afternoon we'll see if you get to see the championship decided next weekend at "The Island". Don't forget to keep an eye out for Packo who will be there as well. Thanks, Gaz. I'm putting a smile on my dial with every mil...err, kilometre. Great riding from Mt Buffalo over to Edi Cutting for the Moto Guzzi Club of Victoria's annual Spaghetti Rally. It rained on the way in but dawned bright after a hard party night round the fire. Them Eye-tal-yun moto boys sure can whoop it up. Today I wended my way over to Daylesford via Yea and Murchison Gap, to Kyneton, mainly the unmarked and relatively unused (unpatrolled?) C & some B roads. Daz! That road you mentioned...Mitta Mitta - Omeo, does that pass a township called Angler's rest? I remember doing a great loop from Omeo - Mt Hotham - Dinner Plain - Bright, then right across to Mt Beauty (I think) then up to Falls Creek (where the Yellow Peril was making v.loud and weird engine noises, which I finished up ignoring, shoving the earplugs deeper into my head...) then across the top, which is also now fully sealed, and then down the eastern side to a place called Angler's Rest. Thence back to Omeo. Wondering if we had turned left at A.R. back up the hill, would that have gone through Mitta Mitta?? Just thoughts for a future multi night getaway. Rickmeister, Anglers Rest is a camping area right at the bridge by the Blue Duck Inn. Just prior to the bridge, maybe a kilometre, maybe more, there's a road which goes back over to Mt Beauty. I did not take that road due to their being a large amount of signage and roadblocks stating the road was unstable. I was headed to Omeo anyway. I didn't enquire with anyone whether this was a temporary situation or not. Mitta Mitta is south of Tallangatta, just east of Yackandandah a bit. I'm not near a map and my phone's only getting 3G due to location so no detail to supply you with. Next day I'd gone round and over Mt Hotham and did ride into the town of Mt Beauty for a cuppa and sanger. It's all a full and fun day (or more) of riding with a variety of accommodation from primitive camping to resort level. Petrol is no worries either, although country towns, as you know, love to label their 95 octane pumps as premium and don't supply true premium 98. To paraphrase Mick Dundee, 'you can burn it, but your bike runs like sh*t'. Enjoyed your travelogues of the Victorian Highlands and others immensely. Pity we are not able to catch up at Smithy's but maybe next time. With great sadness I am readying the steady old girl for yet another long sleep of unknown duration. Catch you next visit or maybe sooner (wishful thinking) maybe. I've got one more full day to go. Why waste it? A day at the beach is in order.